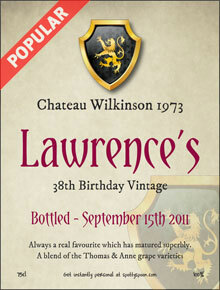 Special Occasion Label for Wine Bottles. 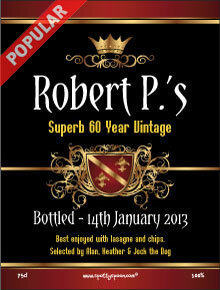 Alternatively, if your make your own wine at home, why not create a personalised label. "A very classy and stylish selection"
Want to give a gift to a friend or relative who has everything? 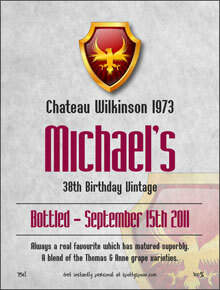 Make them their own personalised wine with our speedy and easy to use wine label templates. This brilliant one really shouts out their name in a prominent way. 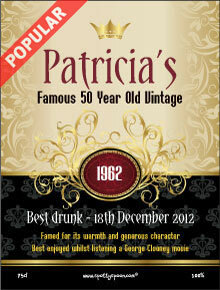 Perfect for birthdays, anniversaries, weddings, christenings, thank yous and retirements. Just add the words to make it unique to them and put it on a bottle. Our printed labels are made from a polyester material which is tough and has a high quality finish. We send to all regions of the world, from The United Kingdom to Canada and from Australia to South Africa. Also, see our Wording Ideas page for great text tips.